Hotel Excelsior Venice Lido Resort offered Ciao Bambino media rates to facilitate a comprehensive review of the property for families. As always, our opinions are our own. This was the first visit to Venice for our family. Rather than staying in the the center of Venice, we opted to stay on the Venice Lido, an island to the north of Venice that sits on the Adriatic Sea and is home to a 12 kilometer sandy beach. The value of being able to experience the city of Venice and explore its canals and history, and afterwards escape to the serenity and calm of a beach was ideal for us. This was a surprise to me as I anticipated wanting to be in the city full time and wondered if staying out at the beach would give us the true Venetian experience. We discovered that staying on Lido Beach gave us easy access city sightseeing activities and beach vacation relaxation — the best of both worlds! We stayed at the Hotel Excelsior Venice Lido Resort and arrived via water taxi, a 40-minute boat ride from the airport. The hotel has a feel of timeless elegance and a sense of history. The Venetians have been coming to this resort for many years and it’s also the main hotel for the famous Venice Film festival. From the lobby and main room there is a breathtaking view of the sea that makes you want to run out and feel the sand between your toes. The hotel is spacious and welcoming. As the hotel is right on the beach and the grounds are expansive, it facilitates a great deal of time spent outside and there is a large swimming pool. If neither the pool nor the beach is of interest, there is plenty of room for the kids just to run around and kick a ball on the sprawling grounds — this hotel has a lot of room to breathe. The hallways are wide and the double rooms are large and open, decorated with tapestries and some have ocean views. It comfortably sleeps two adults and one child with the possibility for two adults and two children without feeling overly cramped. The hotel maintains cabanas that sit on the beach. Guests can rent these for 80 Euros a day. It is stocked with all that a day at the beach requires: towels, a small table and four lounge chairs to relax in while enjoying the sun and sand. There is also food and beverage service available. We rented one and had a great day, playing in the ocean and collecting sea shells. The hotel breakfast is served in a beautiful and awe-inspiring room. Large chandeliers and ornate décor combined with a breakfast with something for everyone is a great way to start the day. The movie Once Upon a Time in America was filmed in that room and it is easy to see why — the glamour abounds in this room. There are pancakes, fresh juice, meats, cheeses, cereal, eggs and any type of coffee (or hot chocolate!) beverage desired. >> The property has a large pool, but beware, like most pools it Italy, it’s not heated and can be cold until summer heat sets in. >> There’s a restaurant at the hotel, but it comes with hotel prices and, at times, uneven service. >> Most of the restaurants and shops on Venice Lido are located on the main street, Via Santa Maria Elisabetta. It is about a mile away and in the heart of town. The walk is nice once in a while, but it is difficult to do multiple times a day with children. The hotel does not provide a shuttle service or bikes, and a taxi costs 10 Euros each way. >> When taking the hotel shuttle boat to and from the city, arrive at the dock at least 15 minutes early. We made the mistake of arriving for a 10:00a boat at 9:55a only to find it full and had to wait until the 11:00a boat or call our own water taxi. >> The hotel WIFI is spotty but is in the process of being upgraded. >> City ordinances prevent hotels from turning air-conditioning on until May 25th. We had unusually warm weather during our visit and our room at Hotel Excelsior was quite warm. The hotel can provide fans on request and the windows do open, but are not screened. 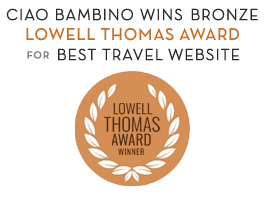 Visit Ciao Bambino’s Italy family hotel collection for a complete review of Hotel Excelsior Venice Lido Resort. You can use our Check Availability Form to connect directly with the hotel for best available rates and packages. The Ciao Bambino booking team will be there to ensure you are taken care of well. For additional questions, email info@ciaobambino.com. Editorial Note: Photos by Kirsten Gaddis except where noted.